Hours: Mon – Fri, 9am – 5pm; Sat – Sun, closed. Handicap Accessible: The building is wheelchair accessible. Insurance accepted: Patients should call their insurance companies to verify coverage. Alameda has a number of business networking groups, many run by women. One of them is Women’s Business Exchange of Alameda (WBE). Like most business networking groups, one of their main goals is to help each other grow their businesses. But WBE has another mission. They contribute a portion of the group’s annual dues to worthy non-profit organizations in the community. 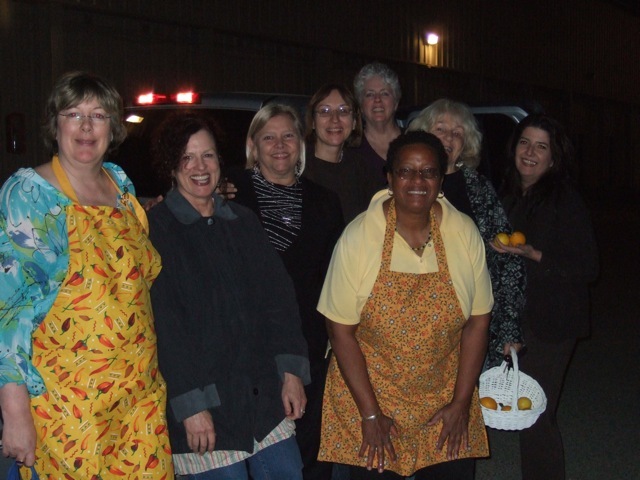 On a beautiful Winter evening, the ladies of WBE hosted a BBQ at a local women’s shelter. This event came about because long-standing WBE member Diane Sickman had a grill in her yard that wasn’t getting any use. Given her huge heart and helpful nature, her first thought was to donate it to the women’s shelter. 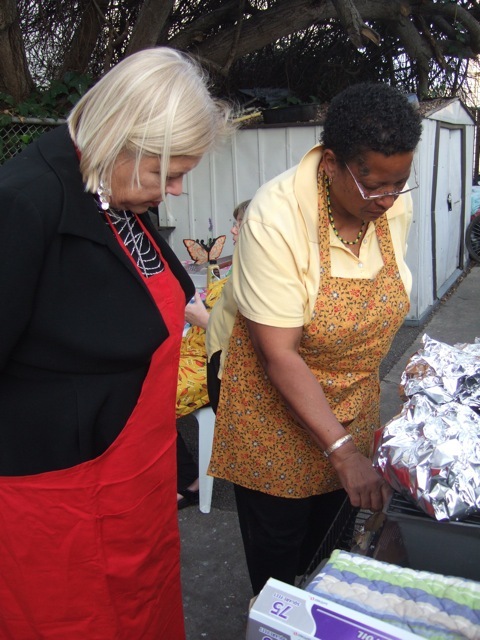 After speaking to the shelter’s director, Diane decided that there should be a big BBQ to inaugurate the grill. 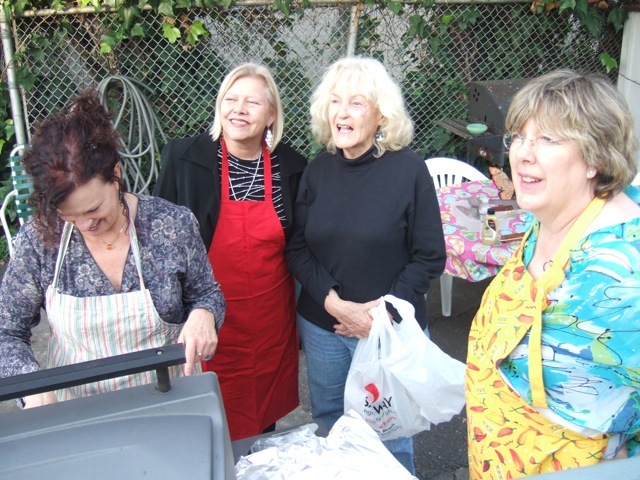 She organized the WBE gals, who cooked food for 30 people: ribs, hot dogs, sausages, and beans. Homemade lemon bars, garlic bread and salad. The shelter folks supplied side dishes and drinks. It was a full-on BBQ, in the middle of February. The women and children at the shelter had a marvelous time, feasting and chatting with the WBE girls. Afterwards, the cooks and servers had their own little tailgate party. It feels good to do good, as you can see by the smiling faces. WBE members from left to right: Vickie Bockencamp, Emily Weil, Ann Cook, Diane Sickman, Helen DeLisser, Kerry Hargraves, Shirley Runco, and Claudia Ruiz. Thank you to Renee Bornstein for writing this article and taking the photos. She’s there, behind the camera. Offering deep tissue, craniosacral, and pregnancy massage. Ms. Ruiz has been providing professional massage therapy to doctors, business owners, the elderly, teachers, sales professional, lawyers and many more individuals for 10 years in Alameda. Ms. Ruiz graduated from National Holistic Institute in 2000, and brings a deep healing in her session to clients with back, neck & knee pain, job stress, grief issues. Her massages also stimulate healing of computer injuries like carpal tunnel syndrome, or even foot & elbow problems. These treatments benefit individuals who need a therapist with a vast experience and a deep caring personality. 501 South Shore West Center, Suite D, Alameda, Ca 94501. San Jose at Foxworthy Chiropractor Center. Claudia also brings community together to experience healing through the sound of crystal bowls. Deep Tissue, Craniosacral Therapy, Medical Massage, Pregnancy massage, Swedish, Shiatsu, and Sports massage. She integrates her skills as a Mediator for her clients as a good listener. Also gives insights about their path that is printed in their hands as a Hand Analysis practitioner. 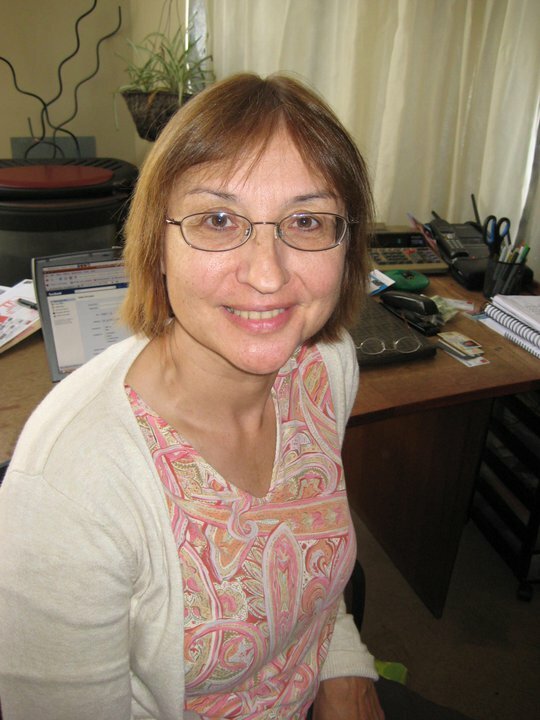 Bockenkamp trained and worked with the Davis Dyslexia Training Program in Burlingame, CA, and also became an Advanced Structure of Intellect Trainer. With Dr. Frank Belgau, of Balametrics, Inc., Vickie studied The Learning Breakthrough Program, still in use at Power Tools for Learning. She did additional research and found another existing program, SAMONAS Sound Therapy, to assist in correcting her own Central Auditory Processing Disorder. listed above Vickie corrected “dyslexic symptoms” and a 95% hearing loss with which she had been earlier diagnosed. Bockenkamp was part of the National Association for Child Development’s Psycho-Acoustic Research Team and has been trained in the application of The Listening Program by Advanced Brain Technologies. In 2001, she developed a protocol for correcting sensory integration issues linked to an individual’s ability to process information. The protocol addresses and corrects dyslexic symptoms, Attention Deficit Disorder (ADD), Attention Deficit Hyperactivity Disorder (ADHD), Central Auditory Processing Disorders, and Physical and Mental Midline processing disorders. The protocol also addresses behavioral visual processing issues, which create stress while reading. with an 80%-90% success rate utilizing her own formulated protocol. She continues her own program’s research and development as she serves her many clients, children and adults, who come from all over the United States. Bockenkamp has a Bachelor’s degree in Psychology and is affiliated with Advanced Brain Technologies, Inc., Balametrics, Inc., and SOI Systems, Inc.
For more information on the Power Tools for Learning Program please contact Vickie Bockenkamp at 510-337-9838 or vickie@toolsforlearning.com. Every year we WBE women enjoy our annual retreat at Asilomar in Pacific Grove, California. We create special moments to rejuvenate, play, inspire, make art, let go, and laugh. The one thing that I do is top prioritize my top three agenda items in a given day – but only 3, no more. I do them FIRST. Top of the list is defined by importance, not by desire. There are two tasks: “demand and batch”. The tele or email is not a demand, but gets in line after your top three agenda items are completed. Something to shoot for. Look at your inbox. Anything that’s been in the basket longer than 30 days, just throw out. Chances are, if you haven’t needed it or had an inquiry about it, who cares? Of course that is assuming you have done the first thing Ali said: don’t move a piece of paper twice.